“You’ll be met at the station,” teases Paul McCartney’s publicist, “where you’ll be blindfolded and driven to a secret location.” In fact, the assistant who picks me up and drives me in her battered estate car to McCartney’s Sussex recording studio couldn’t be friendlier. No walkie-talkie earpieces or security gates to speak of (although the phrase “hidden devices” almost certainly applies), just an unkempt gravel lane winding through lawns and past rose bushes to a group of buildings high on a ridge, overlooking the English Channel. Oh, and a windmill, naturally. 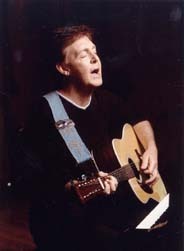 The property is a short hop from his farm, location of the infamous log cabin over which McCartney is currently in dispute with the planning officers. He is mired in certain other legal disputes, too, and the publicist is at pains to point out that questions on this are verboten. So Heather Mills- McCartney is off limits. Long may she stay that way. Her estranged husband, far from looking weighed down with anxiety, exudes bonhomie. It is in stark contrast to his demeanour when I last interviewed him, five years ago. At that time, he was emerging from the deep slough of despair that had claimed him following the death of his first wife, Linda, and was gearing up for his second marriage. Tellingly, he came across then as strident, hectoring, uncomfortable in his skin; he looked old and angry. Today, he is youthful in comparison. Putting the finishing touches to a new pop album, McCartney is doing what he has always done in adversity — seeking refuge, therapy, even, in music. This is one of two points in the interview where what is unspoken hovers, clamorously, in the air. We are sitting in a huge, memento-filled room above the studio, a space filled with light and with views out to sea, above which banks of stupendous clouds scud across a sky that is luminously, unmistakably blue. You have to keep it together in a situation such as this. When, to illustrate a story he is telling, McCartney drags his sofa closer to the one I’m parked on and begins, “Working with John, like this, him there with his right-handed guitar and me here with my left-handed one”, you feel the finger of history running its nail up your spine. Ditto when you notice that his feet, famously bare on the Abbey Road sleeve, are unshod again. It is an effort to maintain concentration. But we can dip in and out of all this. In June, the $170m Beatles-based Cirque du Soleil show LOVE opened in Las Vegas. Last month, it was announced that the Fab Four’s ever alert Apple Corps is suing EMI over unpaid royalties. And in the past fortnight, it has been announced that the Casbah Coffee Club, in Liverpool, where the then Silver Beatles played their first gigs, has been awarded listed status; and that postage stamps bearing the Beatles’ faces are to be issued in January. “And in the end,” they sang in the closing bars of Abbey Road. But it never did end. It goes on. He is back in the promotional fray to talk about Ecce Cor Meum, his new work for choir and orchestra, which he began working on eight years ago. It’s his fourth classical release, following Liverpool Oratorio, Standing Stone and Working Classical. None was especially well received, but then nor were the majority of his post-Beatles solo albums, nor his paintings, nor his book of poetry. In part, this is because the Lennonists have tended to John’s shrine with, it sometimes seems, burnt offerings in the form of McCartney’s poor-relation reputation. Back in 2001, the latter spat back at these snipers. “I, particularly, took a lot of flak with John,” he said. There is no trace of that anger today. Rather, he seems sanguine, more able to accommodate the whole mad journey he was a part of. And it is clear that he sees Ecce Cor Meum as very much another stage in that journey. This insistence on continuity, on a thread linking the Beatles with Wings, with his solo career, maddens detractors. But to him it is an inescapable fact. He got “in the vehicle”, as he calls it, when he was a boy, and he is still at the wheel today. He is, he says, beginning to be able to assess what the Beatles achieved, what they meant, what they still mean. He found the Cirque du Soleil show very emotional. “Because it’s my mates, and because of the fact that it’s no more, except on record — physically no more. In the middle of the show, I was sitting next to Ringo, I was welling up, and I just turned to him and said, ‘F***ing great band. Listen to these noises. How did we do that?’” He is still making those noises; is still, he admits, in pursuit, hearing a chord, bumping into a phrase and off he goes. Downstairs, post-interview, he takes me into the kitchen, where a table is laid with food, and makes me a doggy bag for the train, including a slice of sponge cake. Like I was going to insist on an ex-Beatle using the tongs. Briefly, I toy with putting the cake up for auction on eBay. But you know what? I ate it instead, fingerprints and all. But I kept the napkin he wrapped it in. As you would. 1964 Things We Said Today Macca at his most plaintive and melodically meandering on this minor-key gem from A Hard Day’s Night. 1966 Eleanor Rigby McCartney’s most evocative lyric, and a song that did justice to The Times’s famous Schubert comparisons. 1968 Helter Skelter George called his record label Dark Horse, but it was McCartney, on this White Album, Manson Family-inspiring shocker, who emerged, black as night, from the Beatles stable. 1970 Maybe I’m Amazed People say Patti Boyd inspired great love songs (Something, Layla), but Linda did too. 1975 Listen to What the Man Said One of many songs where you think: nobody else would have bothered to write a bass line this complex and this beautiful. 1982 Here Today From the great Tug of War, the first album McCartney made after Lennon was killed, a heartfelt but unblinking ode to his erstwhile friend. 2001 Blackbird Singing McCartney mixed song lyrics with poetry in this book, writing movingly about Linda. 2005 Riding to Vanity Fair A return to old wounds on last year’s Chaos and Creation album? John’s ghost haunts it.